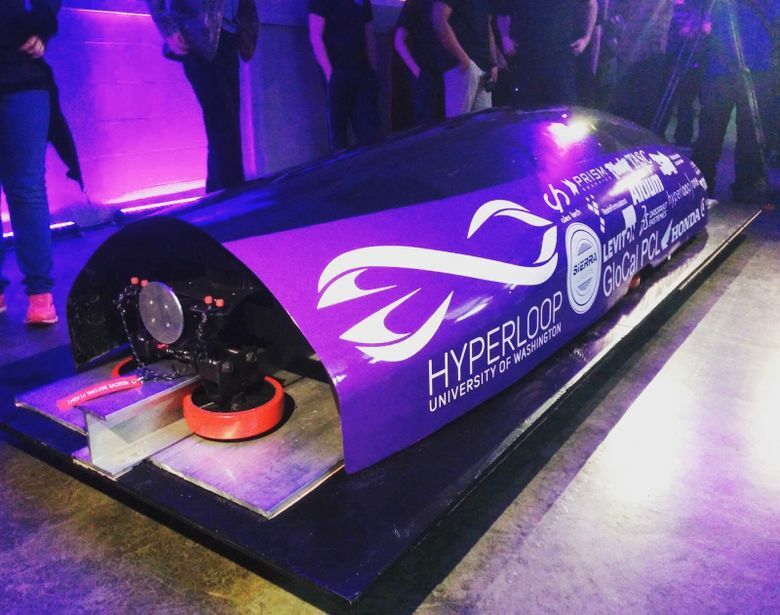 The UW Hyperloop Team unveils its finished pod. A University of Washington team of students came in fourth in the nation last month in a California competition to build the transportation system of the future. A University of Washington student team that’s in a competition to build the transportation system of the future did very well last month in the latest part of an ongoing competition — placing fourth in the nation and sixth in the world. Now, they’re already back in the lab, trying to perfect their pod for the next round of the competition this summer. The students are working to build a pod that would travel in a hyperloop. The theoretical new form of travel is a kind of train-in-a-tube that could rocket across the country at more than 700 miles an hour. That could make the trip between Seattle and Portland take as little as 15 minutes. In late January, the 35-member UW team took its pod — which would be used to transport people or goods in the hyperloop — to Hawthorne, Calif., to test it out, as part of a competition sponsored by Elon Musk, the entrepreneur behind Tesla and SpaceX. In the January competition, each pod was tested on safety, design and scalability, or how easily the design could be constructed, and at full size. For the next leg of the competition, the focus is on speed, said Malachi Williams, one of the directors of UW Hyperloop Team. Williams is majoring in civil and aeronautical engineering. The hyperloop concept was sketched out by Musk in a white paper in 2013. In 2015, Musk announced the global competition for students to design the pods. In the coming months, the UW team will likely focus on its use of composite materials in the pod’s construction, Williams said. For that work, it is helpful to be in Seattle, where there’s a wealth of experience in building things such as airplanes using composite materials, he said. The team has gotten sponsorship, advice and help from the business community. The UW students may also try to build a test track somewhere in the area, and will be looking for new members to replace those who are graduating, Williams said. The UW team has been operating on something of a shoestring, whereas some of their competitors in the California competition had hundred-thousand-dollar budgets, Williams said. And it was pretty obvious, from looking at the final product, which teams had the money and which didn’t, he said. Still, working on a tight budget “makes you a better engineer,” he said, because it requires the students to be more innovative.